I love the taste of sausage and Tuscan kale (also called Lacinato kale). The acidity of kale totally counters the sweetness of the sausage and makes it a perfect match. Today we’re making sausage and Tuscan Kale sauce, which is perfect to serve with gnocchi, or like in this recipe, with a thick risotto. I literally adore to use whole rice instead of white rice, it is harder to overcook and it’s full of fibers. Note: I usually buy a large quantity of Tuscan kale, clean it, and freeze it for later use. This allows me to always have Tuscan Kale when i need it. Boil the vegetable broth, meanwhile melt a teaspoon of butter in a frying pan. We’ll use it to sautè the onion a little before adding the sausages. We won’t need a lot of it, since we’re gonna use the fat from the sausage to complete the cooking. Mince half an onion, or put it in a food processor, then add it to the hot melted butter. Let it become transparent at low heat. We really want the onion to be as thin as possible, to sauté it better (and faster) and later create a sort of cream that will mix all the ingredients together. In the meanwhile, remove the peel from the sausages, and finely chop them. You want it more minced than in slices. Add the sausage to the onion, and let them roast at medium heat. The fat melting from the sausages should prevent the onions to burn, but in case they start to become brown, add a little broth to lower the temperature. Let the sausages to roast and when browned, raise the heat. Sautè with half a glass of white wine, and let it evaporate before turning the heat off. Meanwhile, toast the rice at high heat in a large pan until it is hot to the touch, stirring continuously to toast it evenly, then add a ladle of broth (Caution, it’s going to evaporate very fast) to stop the cooking and lower the heat to medium. Then add enough broth to cover the rice by half an inch, and add 1/4 teaspoon of tomato paste to give some color. Keep adding ladles of broth while cooking when it gets too dry. Mix it gently to avoid the grains to attach to the pot, without breaking them. 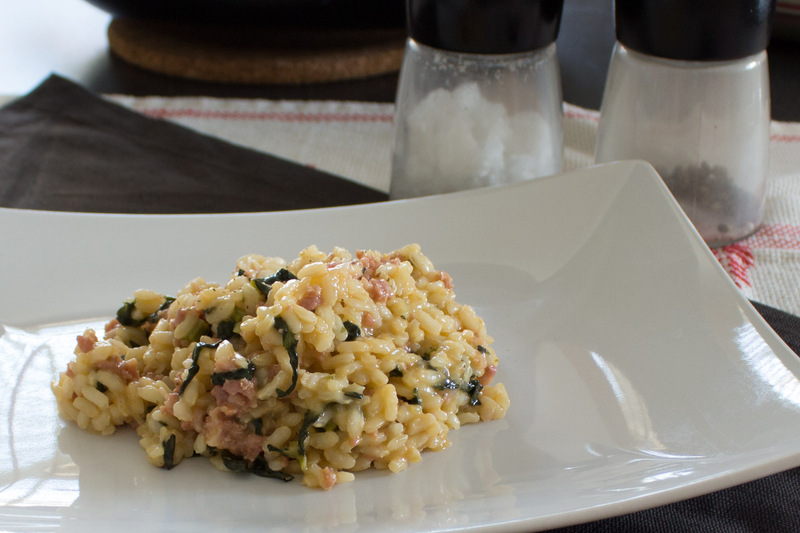 Around 10 minutes before the rice it’s fully cooked (when the rice is soft but still a little crunchy inside) add the sliced leaves of Tuscan Kale and the sausages, mix, and keep cooking. I like my rice very thick, so I let all the broth evaporate before turning the heat off, but if you prefer it more creamy, take it off at the right consistency, or eventually add some more broth until it reaches the consistency you want. Away from the stove, add 1tbsp of butter and 1/4 cup of grated pecorino cheese to the pot with the rice, and mix until everything is melted. Add salt to taste, mix again then cover with a lid for 3-5 minutes to rest and the flavors to blend. When ready, open up and give one last stir, then plate and serve, with an optional grind of fresh pepper and cheese (allow your guest to add what they wish).